This week, a self-driving Uber struck and killed a pedestrian. Autonomous carmakers often praise the technology’s potential to improve road safety, because the vehicles ideally eliminate human error. A transportation analyst says that driverless vehicles would likely not lead to fewer pedestrian deaths in the US, since America’s roads are still designed to prioritise cars over everything else. Making the country’s streets more pedestrian-friendly would likely make them safer. At the same time, proponents of driverless vehicles often praise the technology’s potential to improve traffic safety in cities across the globe. “There are a ton of places around the world that will clear the path to make sure that safer roads, that are more humane, that give time back to the people, that have less congestion and are less polluting – they will make that happen tomorrow if the tech [for driverless cars] is right,” Uber’s former CEO, Travis Kalanick, told Business Insider in 2016. But transportation analysts say this tech-driven utopia – where autonomous cars eliminate driver error and lead to fewer traffic deaths – is not likely. That’s because the things that make America’s roads unsafe – narrow footpaths, wide roads, high speed limits, and the cars themselves – will not go away by just letting a computer take the wheel. Ben Welle, a senior associate of urban mobility at the World Resources Institute, calls self-driving cars a “Band-Aid solution” for America’s high number of traffic fatalities. This year, the number of US pedestrian deaths remained at a 25-year peak for the second year in a row. Nationwide, over 34,000 people die in motor vehicle crashes every year. Reduced traffic speeds. The faster cars are travelling, the more likely they are to hurt pedestrians. Lower speed limits, especially those at or below 20 mph, drastically lessen the risk of fatalities for both drivers and pedestrians. Cities can also install speed bumps, curb extensions, or curvatures to make cars to slow down. Increased access to affordable public transit. Cities with more robust bus and subway systems can cut injuries and deaths from crashes in half. According to another recent report that analysed traffic fatalities from 2000 to 2014, Americans are 24.6 times more likely to die in a car than they are on a bus or subway. Creation of dense cities. Neighbourhoods that are compact and transit-oriented (with transit stops or stations located within a half-mile of relatively high-density housing developments) encourage walking rather than driving. Widening of footpaths, addition of bike lanes and crosswalks, and installation of narrow roads. Cities where drivers, walkers, and bicyclists share the road see fewer traffic fatalities on average. Reducing a two-lane street to one lane requires motorists to yield to each other, and thus helps lower cut-through traffic and driver speeds. Welle also notes that more lanes for cars does not usually ease congestion. Inducing demand for more vehicles, wider highways often make traffic worse. “You can’t build your way out of gridlock,” he said. 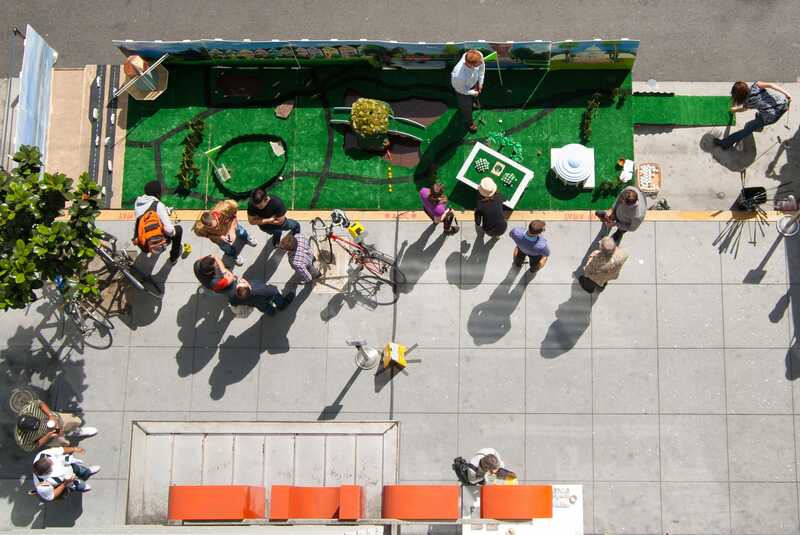 Flickr/urbanists and Sergio RuizA ‘parklet’ in San Francisco, California. The report’s biggest takeaway is that cities should work toward more pedestrian-friendly urban design to improve traffic safety. Welle considers this a simpler strategy than putting autonomous cars on roads. “If you look at incidents with driverless cars, they’re not unlike cars driven by humans. The human body can only sustain so much force, and mistakes are inevitable. So you need to design roads to account for that,” he said. There’s a growing global movement of cities starting to go car-free in an effort to increase road safety and limit air pollution. In the past decade, New York City has banned cars from numerous popular spots, including Times Square. The city might institute a $US11.52 congestion fee for vehicles that enter the city. Oslo, Norway also plans to permanently ban all cars from its city center by 2019. Some metros have come up with other creative solutions, like turning parking spots and highways into parks. Cities that are more pedestrian-oriented tend to have few traffic fatalities per capita. Each year, Washington DC and NYC see only about two to three road deaths per 100,000 residents. Los Angeles and Atlanta, both cities where cars dominate, have triple the traffic fatality rates as other cities with similar population densities. Google Maps/Business InsiderAn aerial view of the location of the self-driving Uber crash. 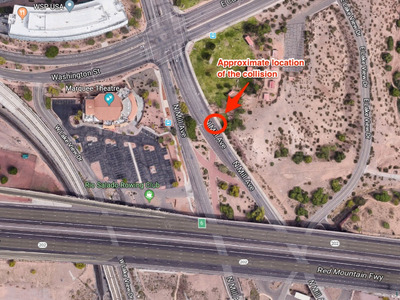 As a case study of not-so-pedestrian-friendly urban design, we can look to Tempe, Arizona – the location of the self-driving Uber accident. It’s unclear if Uber’s technology or the driver who was at the wheel, Rafael Vasquez, is to blame. But the design of Tempe’s roads could have contributed. According to a company spokesperson, the autonomous vehicle was travelling at around 40 mph at the time of the collision in a 45-mph zone, and didn’t appear to slow down when Hertzberg entered the road. It appears that the car wasn’t speeding and didn’t break any traffic laws. Separated by a median, the highway where the accident occurred is seven lanes wide and leads to a giant intersection. That kind of urban design doesn’t promote pedestrian safety, according to WRI’s report. A 45-mph speed limit on a non-highway road also prioritises cars, Welle said. Speaking to The San Francisco Chronicle, Tempe Police Chief Sylvia Moir said the crash would have likely happened in any car – autonomous or human-driven. “It’s very clear it would have been difficult to avoid this collision in any kind of mode based on how she came from the shadows right into the roadway,” she said.